You can’t see them, but there were bees busy buzzing and pollinating all these blossoms. What you see here looks pretty nice, right? But there’s a dark side to this sea of white blossoms under a blue sky. The scene foreshadows a backbreaking chore this summer and fall. When I took this shot of a flowering pear tree in an Albany yard on March 30, I could not help noticing that among all this springtime beauty, lots of little bees were buzzing around among the blossoms. I’m no botanist, but I assume this means that all these flowers will in time become little pears. And around about August, they will become big fat pears. And then they will, one by one — SPLAT! — fall to the ground for weeks on end. What I have found about these pears is that they are pretty good eating, if you like pears. Trouble is that they are ripe enough to pick and bite into for just about 20 minutes. Before then, they are too hard. After that they have begun to rot, and then they fall down. But not all at once. So that means bending down and picking up squishy pears, dozens of them, one by one, every day or so for three or four weeks, and putting them out with the yard debris. just pick them all and put them in a brown bag to let them ripen. Killer! Pears are people too! We demand pear justice! A “flowering pear” tree is an ornamental so doesn’t bear fruit. But fruit-bearing pear trees I hope don’t have a killing frost; that would be sad not only for people who like to eat pears, but for pear farmers. Is this your pear tree? Sounds like you’re very familiar with an over-abundance of fruit that has to be cleaned up. – Apologies to Rod Serling…. I was just commenting yesterday about all the leaves and the good exercise come fall. We have a pear tree in our back yard. Over the years we’ve figured how to harvest for best results. Pick from the tree when they start to look ripe (but are really still to hard and unripe to eat). Allowing them to fall from the tree only results in bruising and rot. Put them in a cardboard box or extra laundry basket in single layers between sheets of newspaper. They will slowly ripen but not all at the same time. Then we enjoy them fresh, share with neighbors, dry in my dehydrator and can a few jars. One last comment, it’s always good to see bees. HH, can we get some ‘facebook-like” affirmations up in here. I really would like to +1 some comments. 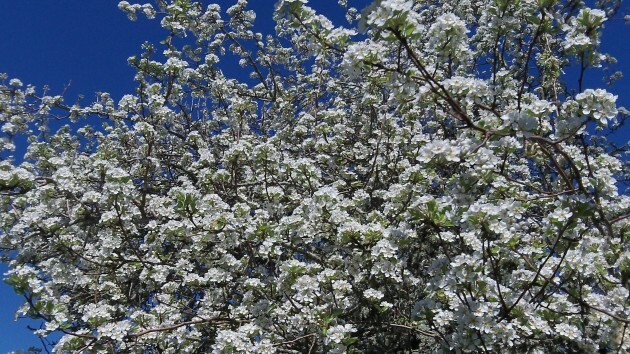 The first sign of the Apocalypse: pear blossoms and bees. What’s next? Sunny days and puppies? Run for your lives! Decided to wait before answering. Pears on the ground are deer fodder. Married a farm girl who canned them (natural and in Xmas colors), dried them in quarters, made fruit leather ( that had a short life unless hidden until Xmas).